Information Site for Watch Strap Collectors! News, Reviews and Forums! The first time I saw a “Bund strap” it was at Sunglasses Hut, and it was mounted on a Gaudy looking Diesel fashion watch. After seeing that monstrosity, I decided that I would never want a strap like that! 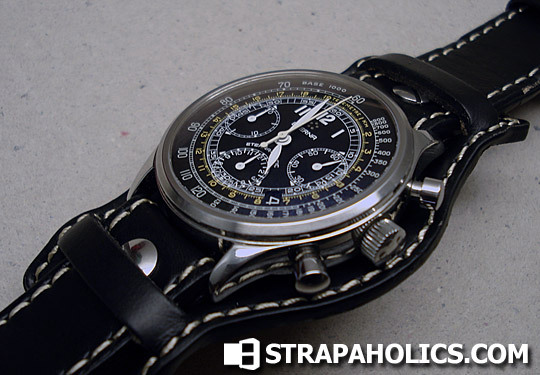 I never knew that there was actually a rich history associated with the straps and that there were tasteful ways to wear them without looking like a fashion victim – no offense to you guys out there with these types of watches, you can keep wearing it along with your square toe dress shoes, its just not for me. I found a guy on eBay that sells these straps, and operates under the business name of “Nilsen’s Leather Straps”. He sells affordable straps that seem to keep his customers happy, and so I decided to gamble and pick up one of his Bund Straps, since he was the best compromise between quality and price that I could see. It was either that or move up to the $100+ range. The whole thing cost me just over $30US shipped. As you can see from the above photograph, I have mounted it on my Eterna Cambridge Automatic watch. Its a 39mm busy-dialed pilot style watch that suits the bund strap quite nicely. The strap arrived this way with some paper inserted between the strap and the pad, which I assume was to protect it from damage. This worked but there was some damage to the strap from contact on the top side which you can see on the photo below. The leather has a pleasant smell to it, and is very soft and comfortable to wear. I purchased the strap with the screws for extra pilot authenticity. 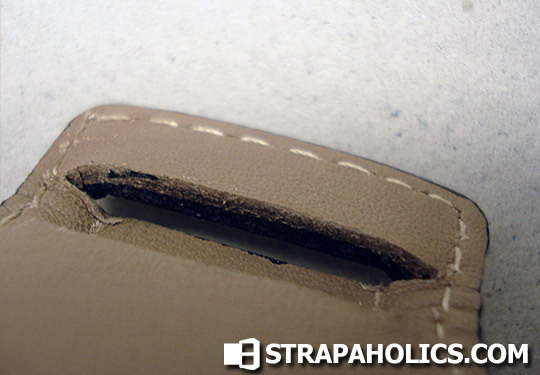 You can see here that the edge-kote came off where the strap was inserted into the pad. 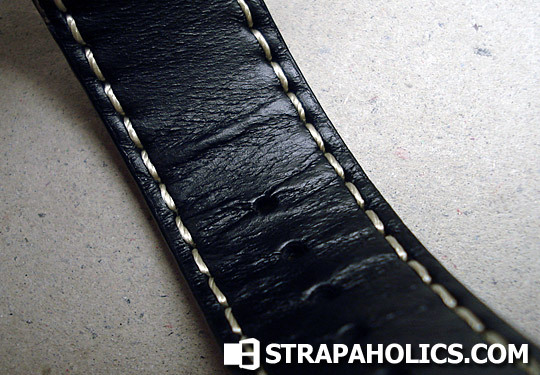 This is not the natural position of the strap, so this wear spot is visible when wearing the strap, but its not the end of the world. Still would have been nicer had it not been there, however. The leather is not of the highest quality, and I can’t even say for sure if it is top-grain leather. 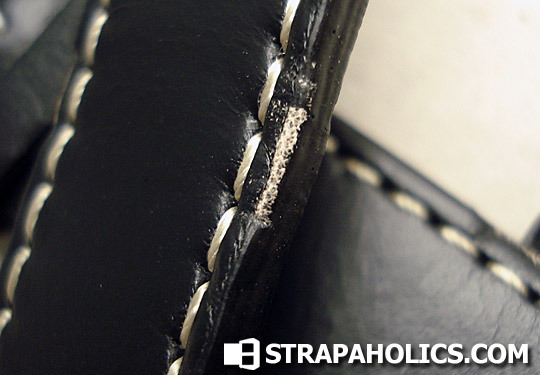 It has that wrinkle to it that lower-quality leathers get when it is bent backwards. 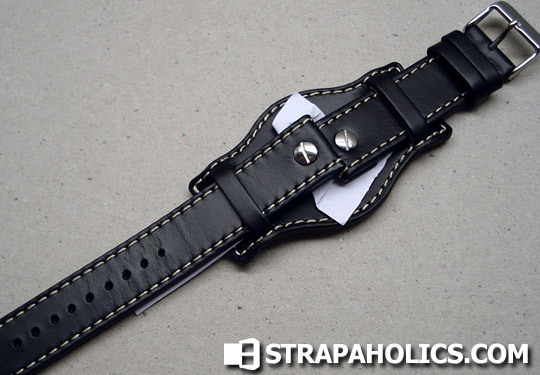 While this is not the best quality strap out there, I’ve seen much more expensive straps with lower quality, and this one is certainly not expensive. As you can see, the leather used for the watch is two different kinds. A softer spongier tan leather is used for the backing, and the black harder leather is used for the exposed side. The spongey tan leather almost has a synthetic feel to it. Regardless of the leather quality issues, this is a sharp looking strap. It looks absolutely stunning on my Eterna Cambridge, which is the watch I purchased it for, specifically wanting the black leather/white stitch combination to set off the watch dial. I think its a beautiful looking combination, and am extremely happy with my purchase. 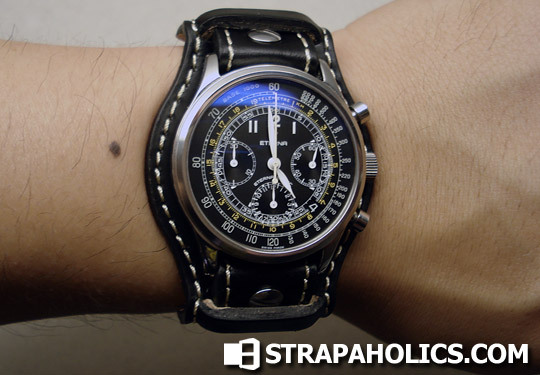 This entry was posted in Watch Strap Reviews and tagged Pilot. Bookmark the permalink. Post a comment or leave a trackback: Trackback URL.